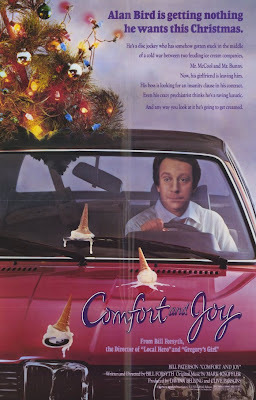 Movie Ramble: Comfort and Joy. At long last I’ve got my hands on a copy of Comfort and Joy (1984), for the uninitiated its Bill Forsyth’s 4th film and the final film he made in Britain up until Gregory’s Two Girls in 1999. There were three other films made after 1984 when he followed David Puttnam to America where Puttnam became Chair and Chief Executive Officer of Columbia Pictures from 1986 to 1988 a move that did neither of them a lot of good! Bill Paterson stars as Alan ‘Dicky’ Bird one of Glasgow’s top radio DJ’s. When the film opens he has a pretty good life, a grand apartment and a rather tasty girlfriend called Maddy. But it’s not until she leaves him unexpectedly he realises how much in love with her he is. Turning to his happily married doctor friend Colin (Patrick Malahide) he’s advised to forget Maddy and find himself someone new. One afternoon while sitting in Glasgow’s traffic he spots a Mr Bunny ice cream van and inside notices a very attractive young lady who he later finds out is called Charlotte (Clare Grogan). Following the van on its journey he witnesses a violent attack, he goes on to unearth a serious rivalry between two Italian ice cream families. Our reluctant hero sets out to end this conflict and hopefully win the admiration of Charlotte. 'Did you want a flake in this?" I’ve already said quite a lot about Bill Forsyth when I blogged his first three films, namely they have considerable warmth and charm, an offbeat humour that is underlined by seriousness and manages to demonstrate realism because his stories are populated with ordinary people who live ordinary lives until circumstances intercede, Comfort and Joy is no different. 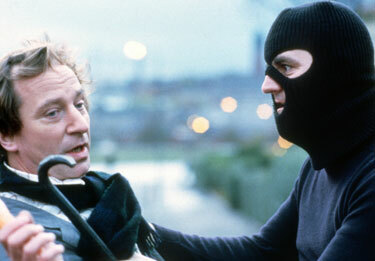 The film received a well disserved BAFTA Nomination for Best Original Screenplay for Bill Forsyth and a Critics Award for Best cinematography for Chris Menges who had previously worked along side the director on Local Hero (1983) as well as working with other British directors including Ken Loach, Stephan Frears, Neil Jordan and Stephan Daldry. As with Local Hero the soundtrack was especially written by Mark Knoffler and was subsequently released on a 12” vinyl 45, which is now pretty rare. Some of the other music in the film came from the1982 Dire Straights album Love over Gold. Maybe Comfort and Joy does not quite reach the dizzy heights of either Gregory’s Girl (1981) or Local Hero but I’m glad I tracked it down and it will sit proudly next to the other two films in my DVD collection. Indecently if you look carefully in the Mr Bunny garage scene your spot an old friend of the Robert Burns Centre Film Club: a certain Mr Robert Buchanan! Some people can be more persuasive than others when selling ice cream!